DSHR's Blog: IT Improves Productivity! My view is that IT is only one of the factors driving the decrease of productivity in the general economy, but that there are some areas of the economy in which IT is greatly increasing productivity. An explanation is below the fold. One of the core issues for economists in the past decade has been the productivity slowdown that began in the early 1970s. Even after accounting for factors such as the oil price shocks, most researchers find that there is an unexplained residual drop in productivity as compared with the first half of the post-war period. The sharp drop in productivity roughly coincided with the rapid increase in the use of IT ... Although recent productivity growth has rebounded somewhat, especially in manufacturing, the overall negative correlation between economy-wide productivity and the advent of computers is behind many of the arguments that IT has not helped US productivity or even that IT investments have been counter-productive. 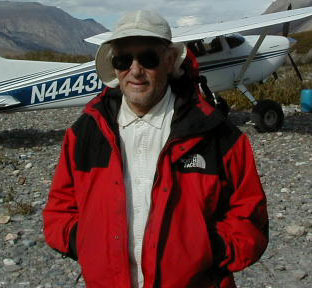 no evidence exists of an abrupt change around 2005 connected to such developments. It is likely that the slowdown around 2004 was due to a combination of factors, none large in isolation, combining to exceed a critical level. 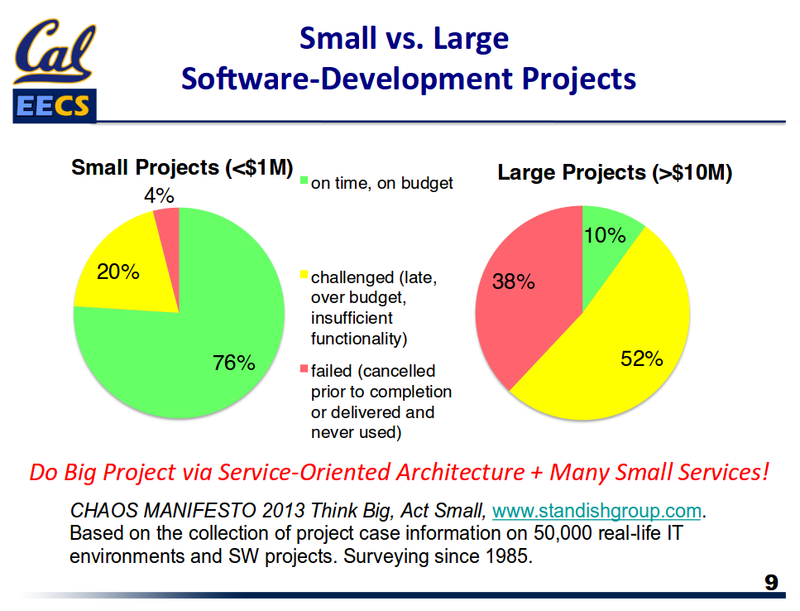 One of them was very probably IT, because the notorious failure rate of large IT projects was driving up the cost while driving down the benefits. 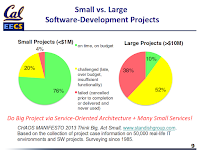 These pie charts, showing that the odds of success decay rapidly with size, are based on a study of over 50,000 software projects over 8 years by the Standish Group. We took a look at hacks that target cryptocurrency organizations such as exchanges. These hacks involve large thefts, often stealing tens or even hundreds of millions of dollars directly from exchanges. Hacking dwarfs all other forms of crypto crime, and it is dominated by two prominent, professional hacking groups. Together, these two groups are responsible for stealing around $1 billion to date, at least 60% of all publicly reported hacks. And given the potential rewards, there’s no question hacking will continue; it is the most lucrative of all crypto crimes. The pre­dic­tions for this year from some analy­sis is that we’ll hit seventy‐five bil­lion in ran­somware alone by the end of the year. These are total losses; the fraction realized by the ransomware gangs is much less, probably only a few percent. But that's still a level of productivity impossible without IT. The third annual Bot Baseline Report reveals that the economic losses due to bot fraud are estimated to reach $6.5 billion globally in 2017. This is down 10 percent from the $7.2 billion reported in last year's study. The fraud decline is particularly impressive recognizing that this is occurring when digital advertising spending is expected to increase by 10 percent or more. That's $6.5B/year revenue for the click fraudsters. Before IT, criminal gangs grossing $6.5B/year would have had much lower margins. Drug smugglers, for example, would have to spend on planes, boats, staff, and bribes, not to mention raw materials. None of these are needed for click fraud. These criminal schemes would have been impossible without the IT systems on Wall Street. The Financial Crisis Cost Every American $70,000, Fed Study Says. The US population is around 325 million, so the cost to Americans alone was around twenty-three trillion dollars. The proportion that ended up with the perpetrators was small, but still vastly exceeds the proceeds of crypto-crime, ransomware, and click-fraud. So, what we have is a small number of people (the denominator) generating a large amount of income (the numerator), which implies high productivity. But since their income is not included in the numerator but they are counted in the denominator, the effect is to reduce GDP and thus reported productivity. Such mishaps are feeding a fast-growing market for specialist cyber-insurance. Solid numbers are in short supply, but Munich Re, a reinsurer, reckons that a market that wrote $4bn of premiums in 2018 could be writing $8bn-9bn by 2020. Rob Smart of Mactavish, a firm that works with big British insurers, says that “almost all” the firms’ clients have inquired about cyber-insurance in the past couple of years. working out who was behind a particular hack has already made the news. Mondelez, an American food company hit by the NotPetya malware, is suing Zurich, a big insurance firm, for refusing to pay out under a general insurance policy. Zurich cites an exclusion clause for losses related to war, on the ground that the NotPetya attack is thought to have been carried out by Russia. Perhaps the biggest difficulty for insurers is that the risks posed by cyber-attacks are not independent of each other. If an oil refinery in Texas floods, that does not mean one in Paris is any more likely to do so. Insurers build that independence into their risk models, and depend upon it in their calculations of the maximum they may have to pay out in a single year. But a newly found flaw in software can make all users vulnerable simultaneously. Insurers fret that a single big attack could hit many of their clients at once. In the worst case, the value of claims might be more than they could meet. ... Whether the industry can figure out a way to deal with such “risk aggregation” is an open question. As one insider says, it “sort of breaks the whole concept of insurance a bit”. Just one more reality check on the relative performance of the advanced economies in terms of labour productivity. Nothing to choose btw Germany, US, Switzerland AND France. The difference is in hours worked/unemployment rate. The point being the difference between GDP per hour worked, and the more normal graphs of GDP per head. 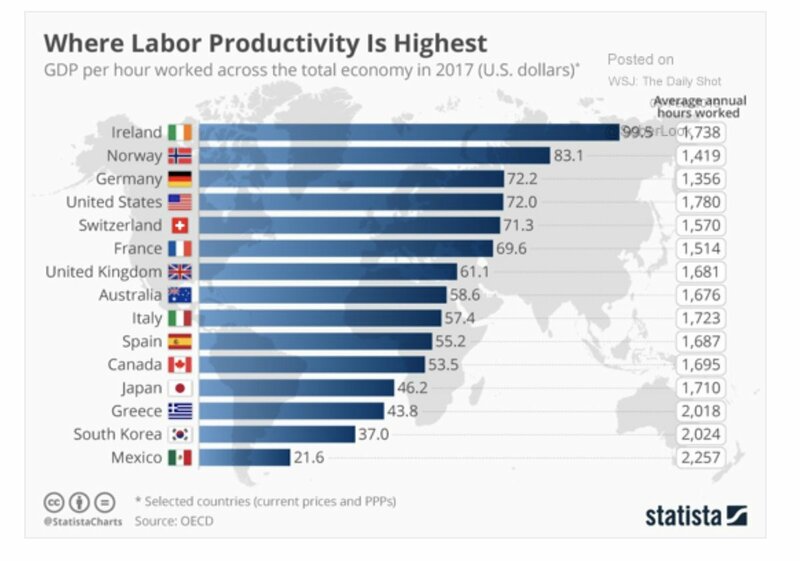 Oh, and ignore Ireland, whose GDP is mostly made up of tax avoidance by large US companies, and Norway, whose GDP is mostly North Sea oil, neither of which involves a lot of work by their population. "Extortionists are promising salaries of more than a quarter of a million pounds to skilled infosec folk willing to put on a black hat, according to research outfit Digital Shadows. Those salaries are on offer to people willing to blackmail and extort money out of "high net worth individuals" – and at the upper end of the scale have even reportedly topped £840,000." Now, that's evidence of high productivity! "Adam Ozimek, Dante DeAntonio and Mark Zandi analyzed data on work force age and productivity at both the state and industry level, with payroll data on millions of workers. They found that the second effect seems to prevail, that an aging work force can explain a slowdown in productivity growth of between 0.3 and 0.7 percentage points per year over the last 15 years." "the YCTAODNT (you can't teach an old dog new tricks) theory of the productivity slowdown"
Paul Krugman points out that, if robots were rapidly taking over jobs from humans, productivity would be rising rapidly, but it isn't. Cybercrime productivity is rising rapidly, according to the FBI, as reported by Xeni Jardin in FBI: Online theft, fraud, exploitation caused losses of $2.7B globally in 2018, up from $1.4B in 2017.